Visit /SouthwestMonarchStudy for up to the minute monarch news! There is much more to learn about the wild monarch migration throughout the Southwestern states. If you love monarch butterflies, consider joining our study. A scientific paper, Status of Danaus plexippus in Arizona, that reports the findings of the first ten years of the Southwest Monarch Study has been published in the Journal of the Lepidopterists' Society. You can download it here. 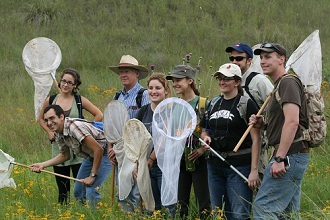 Over 600 Citizen Scientists have tagged monarchs for the Southwest Monarch Study. Since 2004, they have tagged thousands of monarch butterflies throughout the Southwest. Through recoveries, we now know that some of these monarchs flew to Mexico, and others to the coast of California (a recovery is a tagged monarch reported in a distant location) We have discovered monarch breeding habitats around the state and are also learning about monarchs that spend the winter in Arizona. Through analysis of tagging and recovery data, we are also uncovering some fascinating patterns about weather, especially wind, and how it affects the monarch migration. If a monarch you tagged is sighted in another location we will always contact you. Look at our sample map. The yellow/red lines represent recoveries in the 2018 season. The green lines represent earlier recoveries. Everyone! All ages can learn to tag monarchs. We are very excited by these recoveries, but there is so much more to learn. Join a tagging trip or tag on your own. No effort is too small—we never know who will discover a new piece in the monarch puzzle. How to tag? Take a few moments to read this link. Come and join us in some of the most beautiful places in the southwestern United States, have fun, and contribute to the understanding of one of the world’s most spectacular natural phenomena, the monarch migration. We Are Now a Nonprofit Organization! You asked, we listened. Through your encouragement, We are now a federal 501(c)(3) non-profit organization. Your donation helps us purchase tags and print educational brochures as well as offer milkweed seasonally. We are grateful for your financial support of monarch conservation in the southwest. Donations are now tax deductible.